Arrive Delhi. Assistance and transfer to hotel. 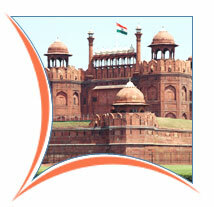 Afternoon, sightseeing tour of Old & New Delhi. Overnight stay. Morning, drive to Shimla- The old British Summer capital of India, Shimla was first discovered by the British in 1819, but it was not until 1822 that the first permanent house was erected. Arrive and check in at hotel. Overnight stay. Sightseeing tour of Shimla visiting the State Museum, which has some modest collection of stone statues from different parts of Himachal Pradesh. Also, visit the Jakhu temple, dedicated to the Monkey god-Hanuman. This temple is at an altitude of 2455 meters. Overnight stay at hotel. Early morning, the 235 kms drive via Sarahan takes about 8 hrs to reach Sangla. Enroute brief stop to visit the Bhimkali Temple. Arrive Sangla- renowned for its beauty with cedar wood forests and is dominated by the Kinner Kailash peak (6194M) One can take gentle nature walks around the camp or just relax to enjoy the breath taking alpine views. Overnight stay in camps. Morning, after the breakfast the 138 kms drive takes about 6 hrs to reach Nako. From the valley of sutluj we go upto the confluence of Sutluj on Spiti.Nako is the largest village in the Hangrang valley. Overnight camp near the Nako Lake. Morning, after breakfast the 122 kms drive takes about 7 hrs. Enroute visit the famous monastery of Tabo (3050M), on the bank of river spiti, is flanked on the either side by the lofty hills. It is the seat of the famous Buddhist Gompa regarded, next to Tholling Gompa in Tibet. It is also known as the Ajanta of the Himalayas, because of its rare paintings. Overnight camp at Kaza. Day Free to explore and individual activities. Overnight in camps. Early morning, visit the Ki monastery (4116M), which is the oldest and the biggestGompa dominating the Ki village. Around 300 Lamas receive their religious training here. You will find some beautiful paintings and scriptures of Buddha and other Gods and Goddesses. 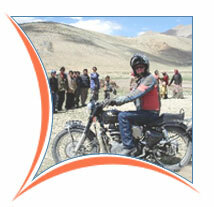 Continue our drive towards Chatru, which is about 127 Kms and takes about 7 hrs to reach Kunzum Pass (4551 M). Drive through some fabulous views of the high ranging snow clad mountains. Overnight in camps. Morning the 86 Kms drive takes about 5 hrs. The drive this day is along the beautiful Chandra and Bhaga rivers. Overnight in Camps. Early morning, drive to Pang. 165 kms drive to over the Baralacha Pass (4892 M) and Lachalung La (5085 M) takes about 7 hrs to reach Pang. On the way enjoy the scenic beauty of desolate mountain scenery. Overnight camps. Early morning, the 173 kms drive would take about 8 hrs, enroute we drive over the incredible Tanglang La Pass (5360 M). We reach the capital of Ladakh. Overnight stay at hotel. Morning, free to relax. Afternoon, free for independent activities. Evening, Ladakhi Cultural show. Overnight stay at hotel. 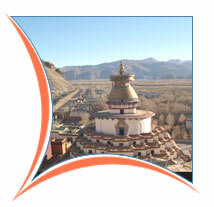 Sightseeing tour of Shey, Thikshey and Hemis Monasteries. Overnight stay at hotel. Assistance and transfer to airport to connect flight for Delhi. Arrive Delhi. Afternoon, sightseeing tour of Old & New Delhi. Overnight stay at hotel. Morning, free for shopping. Late evening, transfer to International airport to connect flight for onward destination.